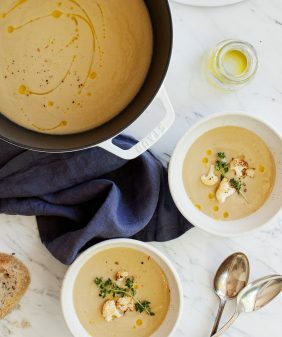 This cauliflower leek soup is easy to make, but you'd never guess it from the taste - roasting & blending the veggies makes it flavorful & satisfying. Thank you all SO much for your ideas & suggestions of what to make with my giant cauliflower. You had so many creative ideas, and I just loved reading through them all. 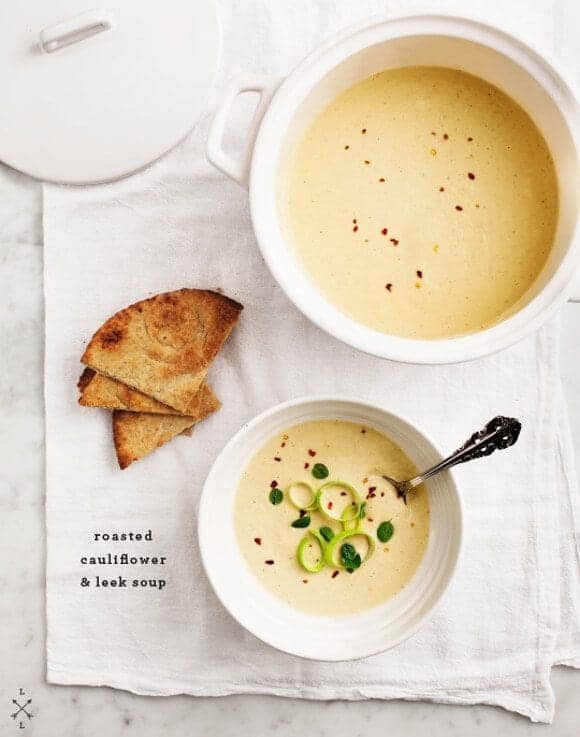 Last night, we curled up on the sofa with this creamy roasted cauliflower & leek soup. (Note: I used cashews for the cream part – if you’re nut-free, check out this creamy vegan cauliflower soup recipe.) This process might look subtle, but roasting the cauliflower, leeks & garlic brings out some pretty big flavors… and in a surprisingly little amount of time. The short version of this recipe is this: Roast. Blend. (But I promise, it tastes fancier than that). Thanks to so many of you for commenting with the leek & cauliflower soup idea… I went with this cashew cream idea suggested by Alisa. With the “toss it all in the oven” method (and paprika addition) as suggested by Anouk. This creamy vegan cauliflower leek soup is a breeze to make - just roast & blend! I love it with a hunk of crusty bread on the side. Preheat the oven to 400 degrees. 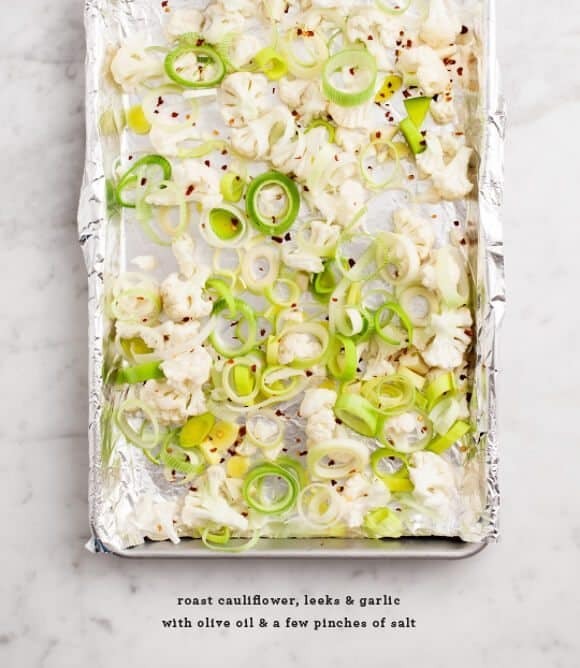 Spread the cauliflower, leeks, and garlic on a baking sheet. Drizzle with olive oil and sprinkle with a few pinches of salt & pepper. Roast for 20-30 minutes, rotating halfway through. Remove when everything is starting to turn golden, but before the leeks are burning (if a few get too charred, it's ok, just pick them out later). Add to your blender the veggies you just roasted, drained cashews, marjoram leaves, miso paste, a squeeze of lemon and 1½ cups water. Blend until pureed. Add the 2 tablespoons olive oil, paprika, and the remaining 1½ cups water. Blend again. Taste and adjust seasonings. Pour into a medium saucepan and heat just until the soup is warm. Stir in a little more water if it's too thick. Serve with bread on the side. *Be sure to use plain raw cashews or your soup will taste too much like cashews. If you're using a high speed blended (vitamix or blendtec), you could get away with soaking your cashews for less time because the blender will liquify everything thoroughly anyway. yummy! that looks delish. Will definitely give this a whirl!! What a fun idea with the idea contest. 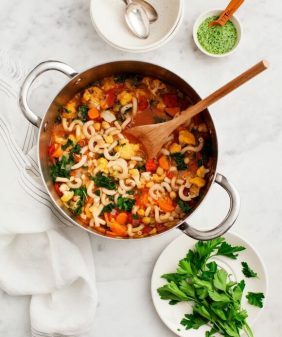 This soup looks and sounds just delightful — and I love the cashews for creaminess instead of regular cream (which is usually too heavy for my stomach)! oh so glad! I know it’s a weird concept at first – the whole nut/cheese thing… thanks so much for the recipe inspiration! This soup looks so lovely. What a great idea for lunch! Do a mix of potatoes and cauliflower. Then he might not know. Yay for cauliflower & leek! I just made a soup a lot like this right before christmas. I didn’t roast anything, though–that sounds like a perfect way to jazz it up! I am so making this over the weekend. A biiiig batch so I have plenty of leftovers! i love leeks and i love cauliflowers, this soup i most definitely will have to try soon! looks delish. Yum! Love roasted cauliflower. So much flavour, yet so simple. This looks wonderful. Okay. I’m pretty positive that we are food twins. Cauliflower week? Sign me up! I’m hooked on it right now, much more so than in the past. Can’t wait to see what you come up with! I loved seeing your take on those ingredients…delicious! 🙂 and beautiful photos, as always. 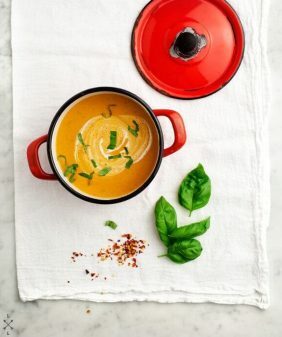 love this soup, one of my favorites ever.. and love that white cocotte!! where did you get it? This looks really good. Perfect for a chilly evening! Oh this came at the perfect time! I need a new soup to warm up my soul after this frigid week. I’ll have to make it when my carnivorous husband goes back to the firehouse to please the tween who wants to be a vegetarian. Wonderful! I just taught my sister to make creamless potato-leek soup — big hit with her kids — but I’ve been looking for a version with more veggies and less starch. Will definitely be making and sharing this one! YUM! absolutely making this this week!! PS: how to soak cashews? (and what does that do)? Hi Alison, sorry that wasn’t clear, I’ll go add some more explanation into the recipe. If you soak them ahead of time, they’ll be creamier when you go to blend them. Some say you need to soak for 2-6 hours, but I find I can get away with less time (or sometimes none) because I use a Vitamix blender. You’d benefit from more soaking time if you’re using a less powerful blender. Thank you so much! Excited to learn a new technique/trick! ok let me know how it goes/went! I made this last night! I almost never make soups because, to me, they just don’t seem like the effort. But this recipe was so quick and easy, I had to give it a try – I’m so glad I did! I doubled the recipe – and then doubled the garlic (what can I say, I’m Italian) – but next time I’d scale back a little. I also didn’t have any cashews, so I subbed almond milk and it turned out great! I’d love to try this again and play around with different ingredients – it’s a great, simple recipe that I feel I could have fun with. I’m a very new reader (4 days) and I’ve already got a cache of your recipes I’m excited to try out. After the success with this one, I think I’ll get cooking sooner than later! I’m glad you liked it! Welcome! This looks great. I love cashews instead of the cream making it vegan. Also seems like such a good pairing with the cauliflower. Really would bring out the nuttiness. MMM, fantastic. I’d almost forgotten about cashew cream – so good. Can’t wait to try this. Darn it! I almost bought cauliflower and leeks at the fruit shop today, but opted out – silly me! This looks like what I wish I was having for dinner tonight! Good gracious your soups are amazing. Inspiring. After the roaring success of your sundried tomato soup, I am definitely making this tonight. And thank you for helping my resolution of going vegan for the month of January be delicious, warming and comforting. looks amazing – making an inspired version tonight! Made this soup tonight and it was absolutely delicious! Soups like this have always intimidated me, but it was so easy and took no time to make. My boyfriend feel in love with it and my mom loved that I used cashews to make the creamy texture (she’s been telling to me for months that I should go gluten & dairy free for the health benefits). Anyways, thank you for the amazing recipe! Like you, I got a HUGEmongous cauliflower from Whole Foods. I’ve been thinking about giving FarmHouse a try though, seeing that we live in Austin as well!! Hi Jeanine, I just discovered your lovely blog and it’s fantastic! I really like adding raw nuts to soups to make them creamy without the use of dairy. I just posted a broccoli basil soup made with walnuts that is really yummy. Thanks for all the goodness you share! Cauliflower is one of my favorite veggies; seriously. This soup looks so silky and I love the use of cashews . So excited to have recently discovered your site! We made this soup last night and it is so delicious. Thanks for sharing! I happened to have all the ingredients on hand (including cashews soaking in the fridge!) so I made this tonight. It was terrific and even our 2 year old loved it. I’m glad I doubled the quantity! You have a beautiful site. This is a great recipe. I like how you combined roasted leeks with the cauliflower and also used miso for an Asian touch. 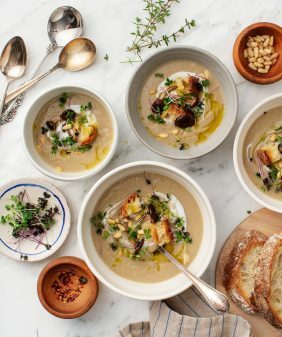 This inspired me to make something similar–a roasted cauliflower and leek soup with a broth similar to what you get in Tom Kha Gai soup (coconut, ginger and lime). I topped it with bacon crumbles, chopped peanuts and cilantro. Yum! I love mixing up a variety of roasted vegetables for soup. So creamy with such depth of flavor! I’m so glad I found this soup, completely delicious! I added a little bit of brown butter and seared scallops to the top and it was so rich and wonderful! oh I bet scallops would be so delicious, glad you liked it! I had my parents over for dinner and cooked for them for the first time. I made this soup and we all loved it! It tasted so creamy and decadent. I brought leftovers to work today and am about to enjoy it again! I haven’t… I think it would work but the texture might become less creamy after you thaw it (I’ve had that happen with similar soups). I’ll sometimes blend it again before I’m ready to eat so it’s super creamy again. If you try freezing this, let me know how it works out! 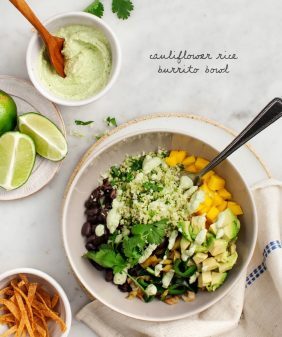 Can’t wait to try this recipe for dinner tomorrow! I couldn’t find unroasted cashews though so I bought roasted. Do I need to change anything before making? Beautiful recipe! I’m all over it. Think it’s okay/better if I use Dutch Oven to roast in? Thanks so much! Dinner is solved for tonight! Thank you! I made this soup and it was the bomb diggity! Thanks so much for the awesome recipes!!! My husband is loving all the new food from your site. thanks Mandy, I’m so glad you liked this and the other recipes! – let me know some of your favorites? I absolutely love this recipe and have made it twice in the last two weeks. I was wondering if you have the nutrional info for the soup? It would be really awesome if you started posting them with your recipes! If I use dried thyme or majoram how much should I use? 1 tsp? I’d maybe start with 1/2 teaspoon (you could always add more to taste), or you can skip it if you want. The miso and the paprika will give it plenty of flavor. This was really good! Thanks for the recipe. I just ran it on high in the Vitamix to heat it up…one less pan. This soup looks so delightful! I will make it this weekend. My husband and I have tried a few of your recipes and they have turned out wonderful. So glad I found you through C+K. And Kate is awesome, too! This is going to be a perfect recipe to try when the leeks are ready in my garden! I love to use raw cashews for cream, frosting….you name it, they can do it! Beautiful photos! I hope to one day reach this level with my photography! What a shame, keep up good work!! I made this as a starter for Thanksgiving. It was fabulous! I multiplied the recipe using 3 heads of cauliflower, 7 leeks plus two regular onions and 2 cups of raw cashews to serve 20 people. I cut and roasted the veggies when I put the cashews in to soak, so all I had to do was whir it up in the blender the next day. Delicious, though it looked like cream of mushroom soup. Only change was to use homemade veggie broth instead of water. That may be why the soup was brownish. The acidity of lemon was crucial. The soup was rich but not heavy, well seasoned yet subtle. I used enough chili flakes to give it heat but not to make it spicy. Perfect for a lactose and gluten free offering and well received by everyone including kids. I garnished each bowl with a few leaves of thyme and some of the smaller bits of roasted cauliflower florets. Great for using the cauliflower and 2 leeks from my veg box, which have been sitting in our fridge for weeks. As partner has a nut allergy, was sorry to omit the idea of yummy cashew cream. Was going to use (probably not quite so suitable ) sunflower seeds, instead, but this soup still tastes creamy, silky and delicious without them. Just made this! Doubled the ingredients and added (canned) coconut milk, coriander, and a lot more lemon juice. I poured it over some cooked red potatoes and it was so wonderful. Thanks! It’s similar but has no nuts! What a happy way for a cauliflower to be eaten!! Cashews definitely added to the joy! I served mine with sliced chorizo sausage that I cheerfully roasted with the cauliflower (local supermarket makes a good chorizo) instead of adding the paprika. Can’t you just feel my happiness through the screen?!?!!!! I made this for dinner last night. I could not believe how easy it was! I did not remember the cashews in time though, and I only have a Ninja (not the blender, the ice crusher/food processor) so I skipped that part. But put in half a cup of almond milk. It was super delicious! And since I’m sick, I used 6 cloves of garlic. It wasn’t overpowering. I’m so glad I made this! Thank you! Yes!! 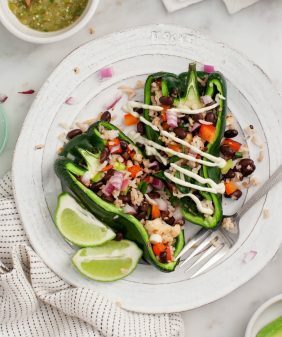 this looks and sounds so delicious and it’ll be dinner tonight, I just put the cashews in to soak 🙂 Thank you.